My Bresser Skylux NG 70-700 refractor I own a small telescope, the Bresser Skylux NG 70-700 refractor. I have used it to view the moons of Jupiter, the phases of Venus, the Andromeda galaxy and the Orion Nebula. The most impressive, and I think what the telescope is best for is observing the Moon. For your enjoyment, I have taken a few pictures of the telescope. The telescope has an aperture of 70mm and a focal length of 700mm. I changed the original finder scope to a laser finder. The original finder scope I found to be difficult to use, it has poor focus and thus I was unable to find anything but the very brightest stars using it. The mount is a EQ3 mount. I found the mount easy to use and quite steady. As I have already stated, I changed the finder scope to a laser finder. This does not magnify the sky, but places a clear red dot in the viewer. I find this much easier to use than the more traditional cross-hair finder scope. I have used this telescope for basic astrophotography. In particular I have taken fairly good pictures of the Moon directly through the eyepiece using a rather modest digital camera. I tend to couple this with a Moon filter which helps with the contrast and helps stop the features on the Moon getting washed out. You can find one of my Moon pictures in an older post here. The telescope came with three eyepieces: 20mm, 12mm, 4mm. This gives magnifications of 35x-262x. This covers “sensible” magnifications for this telescope. Sometimes cheaper poorly made telescopes come with eyepieces that are unsuitable, this is not the case with the Skylux NG 70-700. Although the telescope is quite portable I tend to use it in my back garden, which is far from a dark sky site. This telescope was a Christmas present from my wife back in 2008. I highly recommend Astrostack image stacking software for processing astrophotograhy images. I’ve used it for years to turn blurry, washed out pics into sharp ones. @doG: Yes, I have been told Astrostack and RegiStax are great programmes for stacking multiple images. I have never actually used them, though I have seen great images produced that way. At some point, assuming I get into astrophotography properly I will try these out. And also I am a member of the Southcoast astronomy group and regularly publish images there taken with this scope. Acquired this scope on the grounds of the evidence above and am very disappointed. Prepare for all images to be blurred. Focus is not possible at a level we might think very basic in laymans terms. Terrestrial is as near to not worth bothering – the focus is that bad – shocking really and not a serious consideration. I think astronomers must be a very hardy and very patient group just to secure poor rate imagery – and maybe that’s the nature of this since for crisp images big money seems the order of the day. This scope was touted as at a level of scopes in the hundreds of pounds and if that’s true, would put me off ever bothering to be honest unless you have lots of money. Rich mans hobby! I am sorry to hear that you are not satisfied with this telescope. For the money I have found it quite usable, but for sure not top quality. I should say that I in noway indorse Bresser products, I have only reported on my own personal experiences. MrAnderson seems to have put this scope to good use. Perhaps too late for Ray Owen now, but I have a similar telescope which like the original poster of this page was given to me as a present. I acknowledge that it’s probably not the best telescope for an amateur user, but for someone who’s just starting it could be fine. There are several really big problems though, and for me the worst is the finderscope provided, which is just awful. It is almost impossible to align it with the main scope. This is a really clever way to put people off astronomy – make sure they can’t ever use their first scope, so they give up. RO may have been unlucky, but so was I until a few days ago. I tried to familiarise myself with the telescope, and I also tried looking out of a conservatory. I could see some things near the ground – the shed at the end of the garden for example, but nothing good overhead. Eventually I read in the instructions not to try to use the telescope looking through glass. Noticing a high moon recently I stuck the scope outside and tried to find it. Using the mount as an equatorial mount didn’t work (problems with the finderscope … ) so I reverted to treating it as an alt-azimuth mount, and then found the moon, and was able to focus in on it. This showed that there really was nothing wrong with the telescope optics. Following this I got daring, and within a few more minutes I was looking at the moons of Jupiter – which I’d never seen before. I’m now looking for ways to make the finderscope work for me, or a suitable replacement. Hi Dave, I had to replace my finderscope, the view was just too dim and blurry to be of much use. I have the same scope and even though I am not very happy with the quality of the materials used I think the optics are good. This is my first scope and I wanted to try it for astrophotography. I’ve got a t-ring + adapter set from USA that can do both prime focus and eyepiece projection. I own a Canon 450D (rebel xsi). Today I tried to take some shots but I could not achieve a decent focus in neither mode. I get the feeling that I can not get the camera close enough to the telescope in prime focus mode. When I get the tube as short as possible using the knob I start to see a very blurry image which means I am getting closer to focus but I can not get closer physically. I tried getting the camera farther from the diagonal but it makes focus worse. In both cases it looks like the minimum length is too long to focus. Should I try removing the diagonal ? What else can I do ? 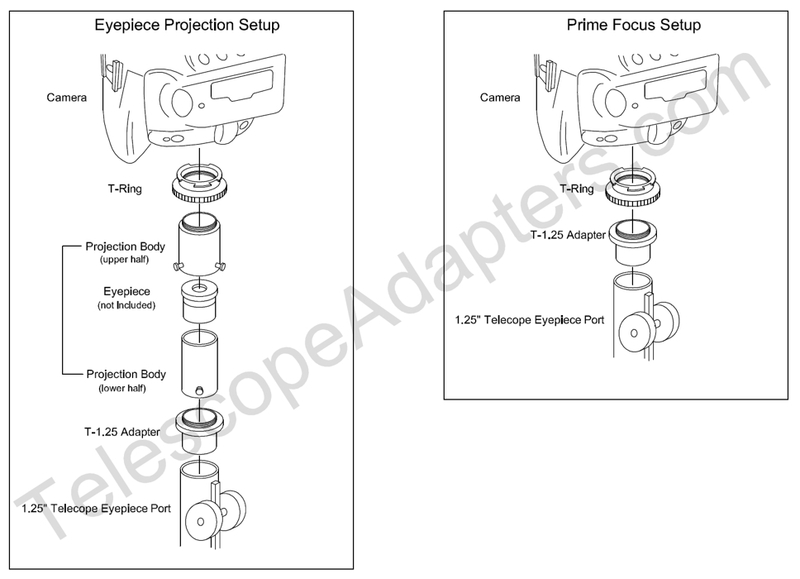 Also what can I be doing wrong in eyepiece projection method ? All I see is a white blurry image or dark if I lower exposure. I did exactly what is shown here: http://www.telescopeadapters.com/DELUXE_KIT_700w.jpg The camera is at my workplace. I am now at home searching for information. I will try tomorrow again but I wanted to make sure I am not missing something. Any help is appreciated. I am far from an expert at astrophotography and I have have not played with my telescope recently. I managed to take okay photographs of the Moon using a Moon filter and just holding a point and click digital camera at the eye piece. I was thinking about getting a bracket for the camera, but as I have been moving about the past few years my astronomy time has slipped away. I am pleased with them given the simple equipment.